By Emilio Camacho, Esq. In life, some people have it better than others. For various reasons, not everyone has the same opportunities and access to resources. In this respect boxing is no different. In boxing, having the right equipment, training facilities, nutrition, sparring partners, and money to cover personal expenses while training, can make a big difference in the performance of an athlete. This is an aspect of a boxer’s performance that is not readily apparent during the match. On the one hand, Sergio Martinez represents one aspect of this idea. Martinez has stated that, in the year 2000, after paying all expenses, he made about $900 for fighting Antonio Margarito. Martinez was already in his third year as a professional boxer. He has often recounted how difficult it was to live and train with such a low budget while trying to compete at a world-class level. To this extent, it is remarkable that he has been able to reach the highest level of the sport. Today, Martinez is able to afford high-level training camps, nutritionists, quality sparring partners, and even a personal tailor to promote his image. In short, Martinez made it to the highest level under significant adverse conditions that often break the boxing career of many others. On the other hand, Julio Cesar Chavez Jr. represents contrasting aspect of this idea. As the child of Mexico’s most famous boxer, he grew up in wealth and influence. As a teen, Chavez Jr. was quickly signed by the top promoter of the day, Top Rank. Subsequently, he was headlining his own PPV events even though he was not a proven fighter or champion. He had access to proper training environments and significant resources at his disposal. He was able to hire the top trainer of the time, Freddie Roach, to take him to the next level. Chavez Jr.’s influence extended so far that his godfather and president of the World Boxing Council (WBC), Jose Sulaiman, arranged a situation in such a way that Martinez would be stripped of the middleweight title and Chavez Jr. would get a shot at Martinez’s title against a lesser opponent. 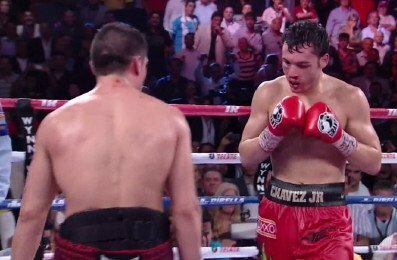 In short, Chavez Jr. had it better than most people have it in the sport. This gets me to the main point of this article. The lack of respect that Chavez Jr. shows for the sports and his fans leaves much to be desired. There are a string of actions that have established a pattern of disrespect and carelessness (weight problems, testing positive for PEDs, skipping post fight drug testing, DUI arrests days before a fight, and testing positive for marijuana). Chavez Jr. needs to realize his privileged position and how lucky he is to have been born the son of his father. Many of the opportunities has would not exist without his pedigree. There can come a point where the fans he takes for granted will turn their backs on him; and all the love and admiration for his father will not be enough to bail him out. In short, Chavez needs to stop the nonsense now! P.S. I hope Roy Jones Jr. vs. Kimbo Slice is a really a joke.